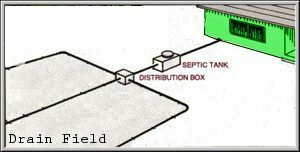 Below are illustrations of how most septic tanks are set up. 1000 gallon tanks are approximately 10’5″ long and 5’4″ wide. 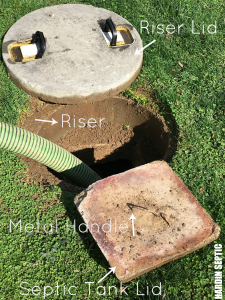 Most septic tanks have 2 lids (with a metal handle) on both ends of the tank. Waste water from your home flows into the tank. Solids then separate from the liquid. 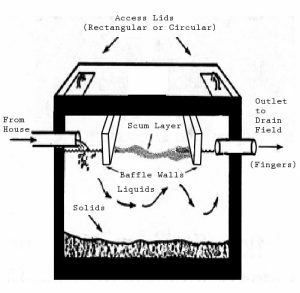 Things such as soap suds and grease, float to the top of the tank to form a scum layer. 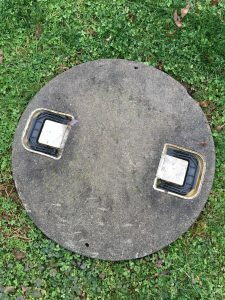 The baffles prevent the scum layer from exiting into the drain field. The liquids will then go into the drain field (also called fingers) while the heavier solids sink to the bottom. Most of the solids are broken down by bacteria. Solids form a layer of sludge that needs to be pumped out on a regular basis. The easiest way to protect your septic system is to conserve water use. The less water you use, the less the soil will have to absorb. Avoid pouring grease or cooking oil down the drain. Minimize use of garbage disposal. Keep heavy equipment and automobiles off the septic system. Avoid building additions, pools, driveways, or concrete near system. Keep roof drains, perimeter drains, french drains, irrigation systems and basement sump drains away from septic system. Don’t wash all your laundry on the same day. This will “flash flood” the system, and agitate the settled solids. Having solids pumped out of your tank, helps prevent costly repairs! 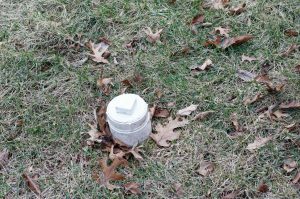 Periodic pumping is needed for all types of septic systems (Mound, Presby, etc). 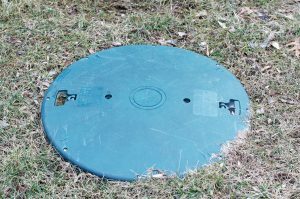 What you put down the drain can have a major impact on how well your septic system works. 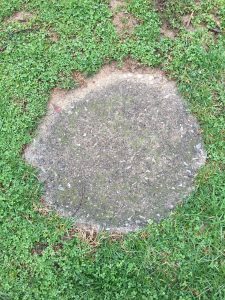 With proper care and maintenance, a septic system can provide many years of trouble free service. The White Pipe is called a CLEAN OUT. It is used for cleaning out/snaking line -NOT for pumping septic tank.